First of all, there is nothing "magic" about interferential stimulation. 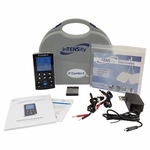 Your IF-4000 sends small comfortable electrical impulses through your skin into the painful area causing a mild tingling sensation. The sensation works to prevent pain signals from reaching the brain. 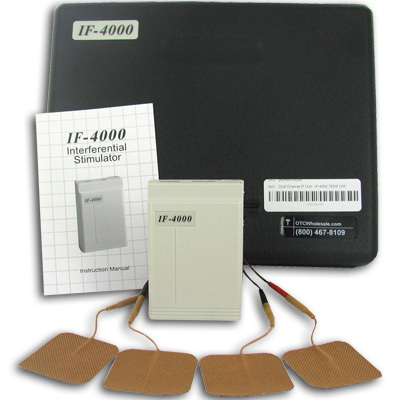 The IF-4000 has two channels, allowing it to operate on either one or two pairs of electrodes which allows a better focus and deeper tissue stimulation when compared to other types of electrical stimulation. 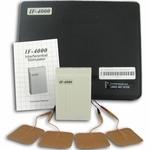 The IF-4000 is supplied with two twin lead wires. When applying only one pair of electrodes, plug the dual connector into the socket "Channel 2" and the electrode switch is set in the "Two Electrodes" position. Use both sockets when applying two pairs of electrodes.